Over the years, I have concluded that the majority of sealcoating failures e.g. premature wear, flaking, peeling, etc, happen due to the bonding problems of the sealcoating to the pavement surface. Sealcoating manufacturers are meticulous in detailing the aspects of material and surface preparation prior to sealcoating, and urging the applicators to comply with them. Still it is not always possible to cover all the bases, considering the myriad of pavement types, age and the condition. In this article we will review the causative factors and remedies that are practiced as good sealcoating practices. The most commonly used direction in the detailed application specification is the statement that the pavement shall be clean, free of dirt and debris, free of surface defects, and suitable for sealcoating. A. For the proper bonding of the sealcoating, it is essential that the surface be cleaned as thoroughly as possible to remove dirt and debris. The adage that “a coating is as good as the surface that it is applied on” holds true for all coatings. If the surface is not clean the coating will not bond and with time and usage it will flake or peel off. The extent of cleaning of the pavement will depend upon its condition, simple air blowing or more involved scraping, wire brushing, blowing or pressure washing. B. The statement that pavement shall be free from surface defects instructs the applicator to repair cracks, surface alligatoring, patching and treating oils spots. Sealcoatings are not repair products; they are coatings to protect and preserve the surface. The applicator must ascertain the type of cracks he is dealing with; non-working cracks shall be filled while working cracks sealed. Similarly, the alligatored surfaces shall be thoroughly examined for any signs of the base failure. Tan/white streaks along the cracks, in alligatored areas surely indicate base failure. Recently I came across an instance where the water was actively pumping from the base on the top of the freshly sealcoated surface. Also I saw many dried white streaks in the same area. Had I not been on the job, I am sure that the property owner would have blamed the sealer. The moral of the story is analyze and investigate, prior to reaching conclusions. It is up to you how you settle the complaint with your customer. C. Oil Spots Priming- It is an essential step which is frequently overlooked and by-passed. It may not be a significant factor for most home driveways but must be considered for commercial applications. You will agree when you see the extent of oil dripping on the parking lots of big chain stores. Sealcoatings will not bond to oil spots if they have not been properly cleaned and primed. Follow manufacturer’s recommendations. Also check if the oil drippings have soaked into the pavement over the years and damaged the asphalt. It may require re-patching. D. The suitability of the pavement means besides other requirements, that pavement has aged sufficiently to rid off the surface oils prior to sealcoating. According to the industry practices (PCTC Specs. ), the freshly laid asphalt surface shall be allowed to age for min.90 days @ >70 º F, and the pavement tested by performing a water-break-free test, by casting a gallon of clean water over the surface. The water should sheet out without crawling or showing oil rings. If these conditions are met, you are ready to sealcoat. E. For old highly oxidized (and powdery) but sound pavements, sealcoating involves removing the surface dust, repairing surface defects (crack filling, patching), priming with a coat of diluted sealer or a tack coat and finally sealcoating. In the following sections we will describe some pavement types and conditions that are generally not described in the manufacturer’s literature. 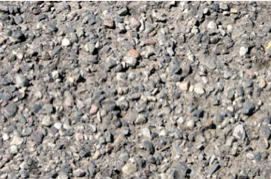 A. Polished aggregate in the pavement. Sealcoatings will commonly wear off from the entrances, exits and the driving lanes of a commercial parking lot. This type of failure is caused by dis-bonding of the sealer from the surface of the aggregate, which become polished (smooth, slick to touch) over the years of usage. The extent of “polishing”, is directly proportional to the amount of traffic and traffic pattern, thus the failure occur at the exits, entrances, and the driving lanes. For any coating to bond, it is essential that surface must have some roughness, e.g. try painting a mirror. Remedy - Prime the exists, entrances and the driving lanes with a thin coat of a specialty primer that is designed to penetrate into the “Polished” aggregate and provide a bonding surface for the sealer. B. Rust Spots in asphalt coming through the sealcoated surface. Rust in asphalt or concrete? Yes and it is very common. Next time you are out for shopping take a closer look at the unsealed, aged, asphalt surfaces. Sometimes you will find them littered with rust spots. Same with concrete surfaces as well but not to the same extent. Rust in asphalt is caused the “Pyrite” in the aggregate. The Iron in the pyrite changes into Iron Oxide (rust) when the aggregate is exposed to air and moisture when the asphalt is freshly laid. Most states allow certain degree of pyrite bearing aggregate in the asphalt mix design and that is where the rusting comes from. The rust bearing aggregate continues to grow in size, as it rusts and finally explodes, creating rust streaks. If such parking lots are sealcoated without any special treatment, the rust comes through the sealcoating, appearing as silvery streaks then turning to rusty streaks. 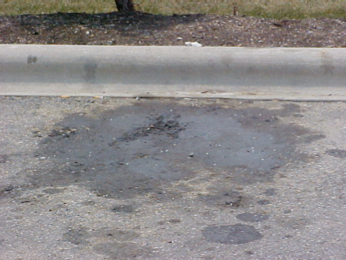 Remedy - The asphalt shall be primed with a specialty rust-inhibitive primer, prior to sealcoating. C. Tree lined pavements may have a special problem where the sealcoating flakes off in spots. This type of failure is caused by tree sap, a fluid produced by trees. Sap is full of sugars and minerals and is generally oozed out during warm weather. Sap falls on the pavement and gets deposited in the pavement. The sugars being water soluble will continue to come through the sealed surface and lift the coating, if they were not removed prior to sealcoating. Remedy - The pavement shall be preferably power washed to remove all sap from the profile. Conclusion- sealcoating failures can be avoided by complying to specifications and paying special attention to pavement conditions and special situations. Your sealcoating manufacturer will assist you every step of the way. 10 Important Items A Sealcoater Should Never Leave Without.